ARC is an analyst firm, in Boston. innovation improves competitiveness: value-based competitiveness raises value of output. Deere putting sensors everywhere, doing predictive maintenance of tractors. In some cases, leasing instead of selling, so they have incentive to keep it operating. 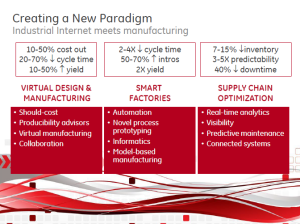 Connective Manufacturing: leveraging big data to drive new insights into operations. Example of Harley Plant in York, Pa. Many new design options (1,700 options), but do 25% more bikes with 30% fewer people. Went from 21 days for a custom cycle top 6 hours. Pepsi: improving asset utilization with SAP Connected Manufacturing: collect all downtime and loss data in real time. Went from 65 to 85% asset use. 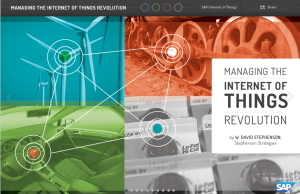 68% of companies see IoT being strategic or transformational to their business. 78% plan to invest in IoT in next 24 mo. — 24% already have. Challenges to deploying IoT include unclear ROI, lack of industry standards, costs, and data security. Next was my presentation on “Getting Started With the IoT,” in which I emphasized that companies that have hung back from the IoT are still in the majority, but had better heed John Chambers’ warning that they’ll be toast in just a few years if they don’t start now. I emphasized that an ideal early focus is to build the efficiency or “precision” of your existing operations, and to build operating safety (especially in inherently dangerous settings such as construction sites), then move on to more radical transformation. I cited GE’s rather modest goal (I think they’re understating it, based on their own internal results) of a 1% increase in productivity for the IoT as something that most companies could achieve, and then talked about GE’s Brilliant Factories as a model for increasing operating efficiency, zeroing in on my favorite example, the Durathon Battery plant, where a sensor on every battery and 10,000 on the assembly line give them tremendous flexibility to cope with differing situations and to increase efficiency. 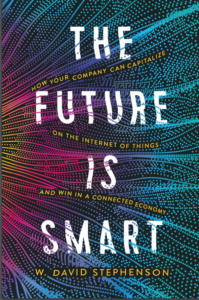 Finally, I suggested that the companies begin to rethink the role of their products and to begin considering the “circular enterprise” vision I’ve articulated as they look to the future. “IoT relevant to all industries.” Agreed. Uses same curve that other SAP guys do: from connect to transform to reimagine (latter being empowering new biz models, value-added products and services. HANA Cloud Platform for the IoT.